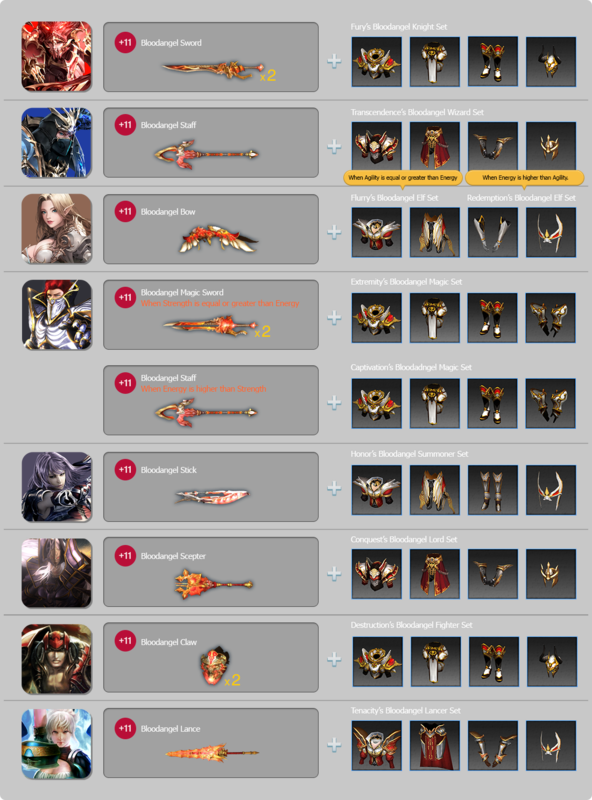 +11 Bloodangel Mastery Weapon(7Days) and Set for FREE! This item CANNOT be used in ELDORADO. If you use the box that you’ve purchased, the item will be moved to Event Inventory. 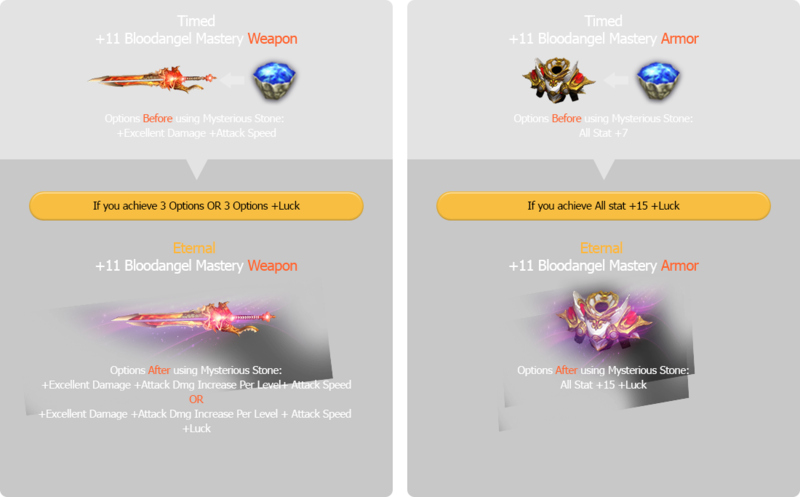 Throw Timed Mastery Weapon Box/Timed Mastery Set Box to acquire Bloodangel Mastery Weapon/Set for each class. 1. Please log into your account to participate the event. 2. 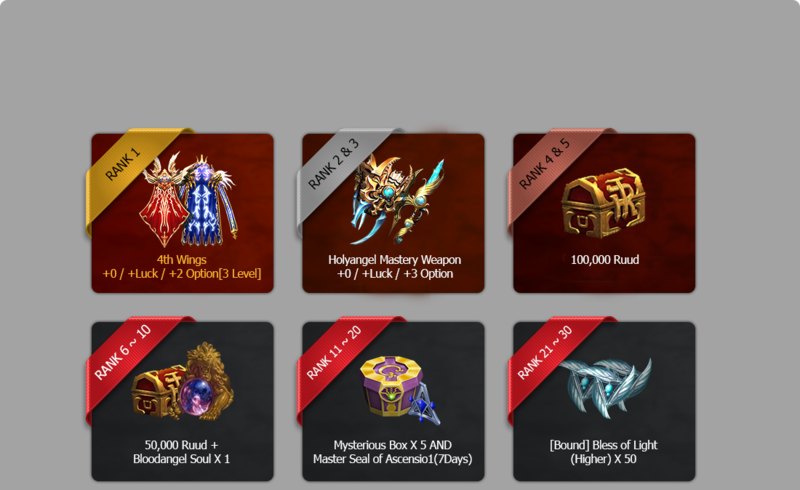 After +11 Bloodangel Mastery Weapon(7Days) and Set(7Days) expires, all options will disappear. 3. Unused Event Items will be deleted on the date of event inventory reset. 4. In terms of Magic Gladiator and Elf, you will acquire different Bloodangel Weapon/Set according to your character stats. 5. The Schedule is subject to change. Best Chance for Best option! By using ‘Mysterious Stone’ during the event period, a chance for BEST OPTIONS will increase! Also, Bonus Options are added! 1. Chance Boost will be only applied during the event period. 2. Even though you’ve purchased Mysterious Stone during the event period, normal success rate will be applied after the event period. Bloodangel Weapon and Set will remain FOREVER in your hands! the expiration period will be extended by 1 day. 2. The maximum extension period is limited to 180days. 3. If you use Mysterious Stone after extending 180days, you can change options but the period won’t be extended. Ranking Rewards CANNOT be used in ELDORADO. How can I achieve “Mysterious Points”? During the event period, if you use Mysterious Stone to either Mastery Weapon or one of your Mastery Set items, 10 Points per use will be accumulated. ** Points will be also accumulated if you use Mysterious Stone to TIMED Mastery Items AND Mastery Set Items you’ve already possessed. If there is more than one user with same Mysterious Point, the player who reached the point FASTER will be ranked at the top. Winners will be announced on 18/12/2018 (UTC). Ranking Event Data will be updated once a day 00:00 (UTC), and you can search the rank until the end of the event. Any Player proven to be the illegal program user to accumulate Mysterious Point will be excluded from the ranking list. Webzen Inc. Global Digital Entertainment Leader ©Webzen Inc. All Rights Reserved.